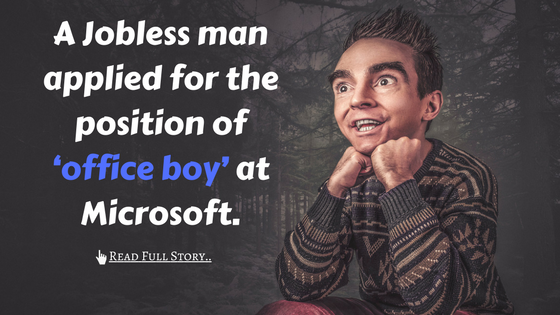 A jobless man applied for the position of ‘office boy’ at Microsoft. The HR manager interviewed him, and then gave him a test: clean the floor. The man passed the test with flying colors. “You are hired,” HR manager informed the applicant, “give me your e-mail address, and I’ll send you the application for employment, as well as the date you should report for work. The man was very disappointed. He didn’t know what to do. He only had $10 with him. Once that is spent, he won’t have any money to buy any food. He went to the supermarket and bought a crate of tomatoes with his $10. He went from door to door and sold the tomatoes in less than two hours. He doubled his money. This way. He started to go every day earlier, and return late. He doubled or tripled his money every day. Soon, he bought a cart, then a truck. In a very short time, he had his own fleet of delivery vehicles. Five years later, the man became one of the biggest food retailers in the U. S. He started to plan his family’s future, and decided to have a life insurance. He called an insurance broker, and chose a protection plan. At the end of the conversation, the broker asked him for his email address. The broker was dumbfounded. “You don’t have an email, and yet have succeeded in building an empire. Can you imagine what you could have been if you had an email?” he exclaimed. If you just lost your Job or Just failed an Interview Don’t worry be Optimistic….. Good days are on the way and something better is reserved for you. All you have to do is Explore, Innovate and Explore!!! I think you would like this post…please comment below..!! !